HypnoBirthing (aka “the Mongan Method”) is a form of form of childbirth education developed by Marie Mongan, M.Ed., M.Hy., and first published in her book “HypnoBirthing– A Celebration of Life” in 1989. Her philosophy is simple: severe pain does not need to accompany childbirth in the absence of fear and tension or special medical circumstances. After much research before having my own baby, I decided to go with the HypnoBirthing philosophy…and am I ever glad that I did! One can learn the HypnoBirthing techniques by reading studying her book and accompanying CD’s or by attending HypnoBirthing classes taught by a certified HypnoBirthing educator. What, you say? How can this work? HypnoBirthing works to make birth a gentle and amazing experience by teaching the expectant mother how to deeply relax her mind (this would be the self-hypnosis part) and muscles, breathe in a helpful instead of harmful manner, release all fear, and work with her body instead of against it. The result is a calm, serene birthing experience that allows the mother to be completely aware during the birthing process (I was so aware that I was able to catch my own daught er) while remaining relaxed and unafraid. Mongan believes that “when you change the way you view birth, the way you birth will change.” Explaining the history of childbirth in her book, she educates the reader on how birth in Western cultures was first a normal part of life that produced few anxieties and complications, but then became something that women feared as it moved into the hospital setting. The causes of pain and fear that women so often think will accompany their birthing experience is also explained with sound reasoning as to why pain and fear are unnecessary and actually harmful–and also how to avoid them. Don’t be fooled by the idea of self-hypnosis presented in this method, either. Self-hypnosis allows you to remain fully aware and in control and is something that you already do without realizing it–like when you zone out while watching TV or driving a car. Learning how to do this whenever you desire to gives you the ability to reduce a lot of tension, fear, and pain during childbirth (and it also helped me to sleep a whole lot better during those late-stage pregnancy nights). In fact, some women are able to achieve a completely pain free child birthing experience through this! HypnoBirthing; The Mongan Method book, 3rd edition (spiral-bound–it’s beautiful!) including a HypnoBirthing CD with “relaxation” and “birth rehearsal imagery” by Marie Mongan on it. 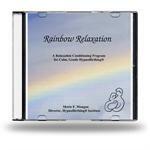 Rainbow Relaxation CD with birthing affirmations (these are so wonderful to listen to) and the rainbow relaxation script (this especially helped me to fall alseep within 10 minutes of going to bed). Button that says “Please Only Happy Birth Stories…Baby is Listening…” with the HypnoBirthing symbol. To enter, you need to head over to the HypnoBirthing website and then come back here and leave a comment with one interesting thing that you learned from their site. You also need to tell me your expected due date or when you hope (in an ideal world) to have your next child. Be sure to leave your email address in your post or it won’t count! This contest will end at 12:00 pm EST on Sunday, May 31, 2009. Good luck, and be sure to check back all of this week to earn additional entries and other prizes! *If you did something worthy of an “extra entry” from this post and want to include those entries here, leave one comment per extra entry stating what you did before (still including your email address). Great information! I’ve always been curious about Hypnobirth so thanks for the info! We are TTC only atm but you never have enough time during pregnancy to prepare for everything! Isn’t it ironic that women moved to hospitals to feel safer and it’s actually resulted in more women feeling scared and out of control of their own birth! We’re expecting our 2nd child in September and I’m hoping that this time through the guidance of my midwives (and Hypnobirthing methods) I can have the birth I’ve been hoping for! I learned that a relaxed mother’s body will produce more endorphins, nature’s own relaxants. My due date is November 6! Yay! As you know, we’re waiting for our hypnobirth with great anticipation. The Rainbow Relaxation Script is by far my favorite. Also, B and I both really enjoyed reading the history of birth in the beginning of the book. P.S. Love the button! 🙂 Thanks! I learned that it is important to NOT get caught up in pushing as much as breathing. I am due October 16th with baby #5. We’re hoping to do the Hypnobirthing class in August…we’re due Oct. 13! Looking through their website again, one thing that stuck out to me is the importance of the “birth companion”. I thought the hypnobirthing techniques were more something you do by yourself – so that was encouraging to read! Thanks for this giveaway! I thought it was interesting that it’s fear, and not necessarily the physiological process, that causes pain. I’m expecting my first child in late October! I am very interested in hypnobirthing. I had my second child in June by VBAC, but thought I could go in blindly and have a natural birth. Boy was I wrong! LOL! I’ve looked at the hynobirthing website many times, but never at the statistics until now. There are some very compelling statistics there proving that this is a great system!! I’ve read a bit about hypnobirthing, and used some of the methods myself when birthing my 3 children without medication, but I hope to have another baby within the year, and I’d really like to formulate a real hypnobirthing procedure with exercises and relaxation techniques to help me through my labors since I don’t like assistance from others, and like to find the ability to labor from within. Wow very interesting! Seems that fear is the worst thing during labor! I’m due early December and will be looking more into this. Thanks for the link! I’m a HypnoBirthing practitioner, and I blogged about your contest. I will also follow you. Thanks for highlighting what we do! I learned that the founder of Hypnobirthing has 4 children, 2 of whom were born at home. I also plan on having baby #2 in a year or two. I learned that 70% of Hypnobirthing moms had an unmedicated birth – which is exactly what I hope to do! We’ll see if it happens on or around Sept. 1 when baby #1 makes her appearance! i j/had my 2nd daugter by ceserian (again) due to my fear of natural childbirthing pain. im wanting another child n about a yr but i really dont want to go thru surgery again. imeither wanting to try the hypnobirthing method or the bradley method next time ’round. I learned that only 15% of Hypno Birthing moms had C-sections. My best friend is due July 14th, so I would give this to her. I learnt that giving birth is supposed to be a beautiful event, not a fearful one. When you are relaxed it is such a joy to bring your baby closer to you with each surge. I’ve learned that Hypnobirthing is not so much about being hypnotized as it is about relaxing while your body goes through perfectly normal and natural birthing rhythms. We hope to start trying for baby #2 this fall.